In an out-of-the-way corner of Tottenham in northern London, a narrow footpath leads across a meadow from the banks of the River Lea to a row of brick industrial buildings that clearly have seen better days. The buildings’ current occupants are the sort of businesses most of us take for granted: a manufacturer of decorative cake bases, a moving company, a recording studio. Separated from this hidden pocket of enterprise by a row of burly sycamores is a garden, normally secure behind a padlocked gate but open this morning to nearby residents—recent immigrants who work the soil, keeping their homeland traditions alive while subsidizing their hopes for a better future. The garden is a riot of bright colors and soft edges. Blue barrels gather rain. Narrow limbs dropped by the sycamores have been roped into arbors for bean and tomato vines. Wild currants and blackberries grow in thickets wherever their exuberance is tolerated. An elderly man and his daughter emerge through the open gate, their bags bulging with peppers and cucumbers. Up the road toward Ferry Lane, a massive crater is being excavated by a pair of gigantic laboring cranes. Hoardings (Brit-speak for temporary billboards) announce the construction of a multistory apartment building with waterfront views. One of the banners reads “In harmony with nature.” Another declares the coming development “A place for reflection.” Gulls keen overhead. Meanwhile, an unbroken stream of traffic flows across the humpback bridge that borders the construction site. The bridge’s hollow arc amplifies the screech of braking buses and the rumble of heavy trucks. As I was to learn, a hundred years before, this stretch of riparian real estate had been home to a very different sort of activity. During the summer of 2007 I had the opportunity to take on some speculative work. 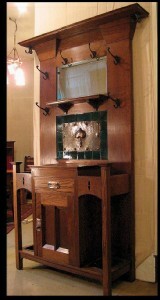 Russ Herndon, a Bloomington, Ind., designer and neighbor, had a distinctive English Arts and Crafts sideboard. 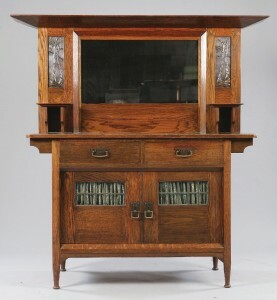 His dealer, Chuck Johnson, of Southern Indiana Arts and Crafts Antiques, believed the sideboard might have been made for Liberty & Co., the firm whose shops in Regent Street, London, made Arts and Crafts–influenced furnishings and other wares available to middle-class buyers before and after the turn of the 20th century. A collector of English and American Arts and Crafts, Russ was no newcomer to the genre; he counted Stickley, Roycroft and Limbert originals among his holdings. But this sideboard, about whose origins he could not be certain, was one of his favorites, in part because of its refinement relative to the severity of many American Arts and Crafts classics. The cabinet’s style is distinctly English, with exaggerated bevels, broad overhangs, graceful arches and bold interplay between the vertical and horizontal elements. Still, there is something homely about it. The oak is plainsawn, not quartered. The grain of the drawer faces isn’t matched. The drawers were dovetailed by machine. Hardly the sort of quality we associate with the finest Arts and Crafts. Yet it is a beautiful, functional object. I asked Russ if he would let me craft a reproduction, and he agreed. We called it the Liberty sideboard. Several months later Russ told me he had contacted the U.K.–based Arts and Crafts dealer Mark Golding, who directed him to a page from an auction company’s Web site. There on the screen was a cabinet identical to Russ’s. 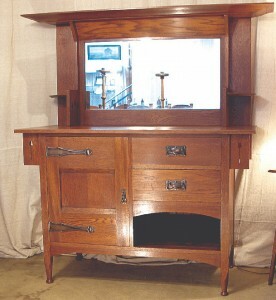 “An Arts and Crafts oak mirror-back sideboard…registered in 1903,” read the description. Harris Lebus had been the maker. Harris Lebus? Neither of us had ever heard the name. A search of the Web turned up a brochure that had been produced in conjunction with an exhibition, “Investigating the Past—The Harris Lebus Factory.” (An Acrobat PDF of the brochure is available online; Google “lebus exhibition.”) The company had lasted a very long time—from its origins in the 1840s until the mid–20th century. It had been substantial, employing some 6,000 workers at its peak during the 1940s. It had been founded by a Jewish tradesman and had been well known during the early 1900s as an employer of Jewish immigrants. It seemed clear that interest in the company had been revived by the local government, which was working with a group of property developers on the riverfront project. This seemed a story worth pursuing. The Bruce Castle Museum had hosted the exhibition. I contacted Deborah Hedgecock, the curator, and booked a trip. 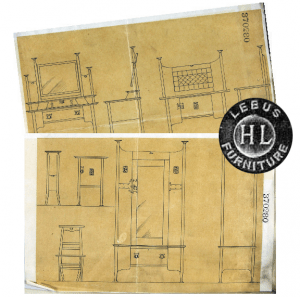 Harris Lebus had its origins in the 1840s when Louis Lebus, a German-Jewish cabinetmaker, emigrated to England from Breslau. Louis enjoyed good fortune in England. He set up shop as a cabinetmaker in the port city of Hull, where his business flourished. He then moved to London, where he outgrew one set of premises after another, and in 1875 he moved with his family to the relatively prosperous Georgian neighborhood of Wellclose Square. After he died in 1879, his eldest son, Harris, took over the firm. Six years later, he relocated the shop to Tabernacle Street in Finsbury, in London’s East End. London’s furniture industry had changed markedly in the mid-19th century. As a growing middle class aspired to live in style, the demand for affordable furniture prompted the development of furniture manufacturing in the East End. Unlike West End shops, which had a long tradition of refined craftsmanship grounded in the apprenticeship system, the East End offered opportunities for entrepreneurs of large ambition and little means, many of whom kept costs low by working to order and dividing furniture construction into a series of simple processes that could be carried out by workers of limited skill. By the mid-1880s, Harris Lebus was no small-time tradesman but the head of an established firm with dedicated manufacturing premises outside his family’s home. Although the company had not originated in the hardscrabble world of East End furniture making, it prospered mightily in that milieu. By the 1890s Lebus had become England’s largest furniture maker, with around a thousand employees. 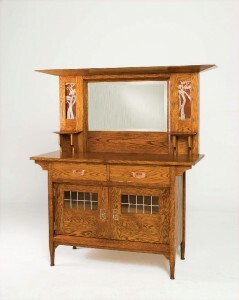 Between 1890 and 1910, the company produced some of its loveliest Arts and Crafts designs, one particular line of which is exemplified by the 1903 sideboard. The pieces were made in oak and incorporated stylistic elements as varied as exaggerated bevels and bracket-supported overhangs, ring-turned feet, beaten copper panels with Art Nouveau motifs, capped finials and heavy, Gothic hardware. It was not unusual for several of these elements to appear in a single piece. The company’s designs are further notable for their wide stylistic variation; some pieces are graceful and refined, others angular and chunky. Delicate and muscular are often combined, as are Gothic and Art Nouveau. Original Drawings For A Set Of Bedroom Furniture Registered In 1901. Photo Courtesy The National Archives, U.K.
And respond Lebus did, producing wardrobes, dressers, dining sets, hallstands and sideboards. The company had a private phone line for calls from Maples, a large furnishings store located near Heal’s on the Tottenham Court Road in downtown London and Lebus’s most valuable commercial account. A salesman called on Maples twice daily to take orders. The company also exported to South Africa, Australia, New Zealand, India and South America, in addition to France, where they had a showroom on Paris’s rue de Faubourg Saint-Antoine. In New York they sold their products through Wanamaker’s. Lebus further responded to the demands of commercial survival by regularly updating its premises and equipment. In January 1900, needing room for further expansion, the company purchased 13 1/2 acres of land in Tottenham—at the time a village north of London on the marshy banks of the River Lea. The river location was ideal for receiving materials, many of which came from overseas—hardwoods from the United States and softwoods from eastern Europe. The new factory was also located on two railroad lines. The Lebus works at this location would eventually cover 43 acres. Unlike Morris’s Firm, Mackmurdo’s Century Guild, Ashbee’s Guild of Handicraft and others, the Harris Lebus Co. was no small group of artisan-philosophers but a factory-based, capitalistic enterprise. Its wares were made by specialized workers in diverse departments, a practice that would have made the movement’s luminaries shudder. Nor is Harris Lebus known for the signature designs of a Voysey or Mackintosh. Whatever artistry its Arts and Crafts–style furniture possessed was patiently brought forth by the company’s principal designer, one Mr. Archer, who had to suffer the indignity of seeing his creations tweaked by profit-driven directors. The company also made parts for other furniture manufacturers and occasionally subcontracted production to other shops. Notwithstanding Lebus’s capitalistic raison d’être and unabashed reliance on popular designs, it would be a mistake to regard the company as lacking principles or values. Through several generations, the family directors steered a steady course, neither ruthlessly exploiting their workers nor abandoning their enterprise on the grounds that they would never achieve social or artistic perfection. The company’s Arts and Crafts furniture may have been made in a factory, but the workers who made it enjoyed conditions radically superior to those endured by their Dickensian predecessors. Harris Lebus continued operating into the 1960s, keeping thousands of workers employed through some of England’s most challenging years, largely by virtue of its success in adapting to changing times. During the first World War, the company produced materiel for the ground war on the continent as well as parts for Handley Page and Vickers-Vimy aircraft. During World War II, with 6,000 employees, the company manufactured Horsa gliders and Mosquito jets, assault-landing craft, and wooden replicas of Sherman tanks designed to deceive German pilots flying air reconnaissance. In the postwar years, it participated in a government-sponsored plan to provide affordable utility furniture to returning veterans and their families whose homes had been destroyed by bombing and rocket attacks. This very longevity may be one of the reasons for Lebus’s lack of visibility among today’s Arts and Crafts enthusiasts. In contrast to the movement’s leaders, who went down with their ships early in the century rather than adapt to changing fashions after the first World War, Lebus deftly responded to public demand, turning out wares in more streamlined modern styles for another 50 years. Ironically, much of the company’s newfound visibility has resulted from the assessment and cleanup of the urban brownfield that eventually resulted from its closing. 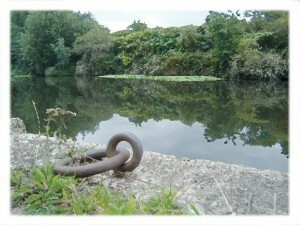 Around 2004, the Borough of Haringey pursued plans to transform the former Lebus property north of Ferry Lane into a riverside asset, which entailed testing for toxic residues left from earlier uses of the land. That investigation led researchers to rediscover the almost forgotten company. Recognizing that the Lebus story held the potential to strengthen community identity, the borough subsidized the exhibition at the Bruce Castle Museum. Today, Hale Village, a mixed-use development that will include a significant percentage of affordable housing, is under construction, with completion expected in 2012. What of the considerable body of Arts and Crafts furniture Lebus produced? An increasing number of pieces pass in and out of antiques stores today, all things Arts and Crafts having found new appreciation during the past 40 years. The furniture is there; awareness of the company has just been slow to emerge among Americans. Its relative obscurity notwithstanding, the story of Harris Lebus furniture offers new perspective on how Arts and Crafts ideas influenced daily living among the growing English, European and American middle classes during and after the movement’s golden age. Much as the Craftsman or California bungalow became the commonplace embodiment of what Morris might have called an “artful life for the people,” the easily taken-for-granted “second division” Arts and Crafts furniture manufactured by Harris Lebus lent new and graceful meaning to living in style in Great Britain and around the world at the turn of the 20th century. Writer and cabinetmaker Nancy Hiller lived and worked in England for 16 years before returning to the U.S. in 1986. She is grateful to the following individuals and institutions for their contributions to this article: Roy and Mimi Griffiths; Keith Bartlett and Mary Fran Gilbert; Paul Collier; The Geffrye Museum, London; Bruce Castle Museum, London; and The Westminster Archives.